JUNIOR BLOG (Fri): fishing with our fellow bloggers – includes video & competition! FOR the last two years we have attended and have helped to organise the YouTube Fishing Bloggers’ Match. This year it was held at Seven Lakes Angling near Aldermaston in Berkshire. The previous year on the River Thames at Pangbourne, there had been very few fish caught, but a good laugh was had by all. We hoped for just as much fun, but a few more bites this year! Finally, we were on our way, car loaded to the absolute brim with tackle and camping equipment because straight after the match we were heading to the River Wye for a few days. It was great to actually meet all the different YouTube fishing bloggers as previously we had only talked to them online. It is quite strange talking face to face with someone who you watch on your computer; in fact it felt like we knew everyone so well even though it was the first time we had met some of them. Now for the actual fishing; on arrival at the venue there were carp showing all over the surface, fish between 2 and 7lb cruising around the snags. We could not resist throwing out some mixers even before the draw for swims! Alex and I drew peg 7, and rather unfortunately it was the only swim on the lake that had a big tree hanging in front of it, meaning for the next 24 hours we could only underarm cast. Not to be disheartened we started balling in some groundbait laced with corn, dead maggots and mini pellets. We picked two spots, one right underneath the tree and one to our left margin, and hoped they would produce a few carp come the night when there was less bankside disturbance. There had already been a handful of carp and masses of perch and rudd caught, even before we started cooking the barbecue. Definitely an increase of fish related action compared with last year’s event. We placed sausages and burgers on the BBQ and Joe from ‘Nuffin but Fishing’ supplied plentiful amounts of cider. Whilst I was away filming George (Fenland Fisherman) playing a fish, the sausages caught alight and started burning, flames leaping everywhere and smoke clouding up the bank! Luckily George’s Dad and Mark from ‘Fishing for Memories’ gave me a hand with taking the food away from the flames and letting them die down before finishing cooking. Everyone reeled in and we sat round to eat our food. It was a great laugh and a chance to talk to people who do the same as us, make fishing films. We all shared our video blogging stories and had great fun before heading back to our swims and casting out for the night. In the morning we spent most of our time playing pranks on people involving bite alarms and dog biscuits. We had a great laugh but sadly the match was coming to an end. At around 10.00am we packed away and said our goodbyes; everyone agreed that next year’s match would be even better and we would invite even more YouTube fishing bloggers! Hope you enjoyed the blog and take a look at the video we made of the event. Hint, don’t take it too seriously! THE CARL & ALEX BLOG RETURNS HERE NEXT FRIDAY, AUGUST 9. 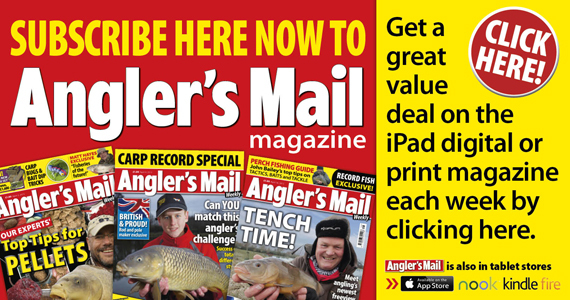 And get the full picture on all things angling by reading Angler’s Mail magazine every week.